Why don’t we tell our children the truth about The System as soon as they are old enough to understand? Regrettably, I was not awake enough to tell my young children about the game that we are all playing, and that their participation is optional. Fortunately, my kids woke up and after years in the traditional school system, they each independently saw through the holes in the system, and they left before they could be rewarded with completion. I’m the proud parent of three brilliant, and awake, high school drop outs. Luckily, by the time they had the wisdom to make their own choices, I had the courage to support them. We are waking up but if we are still raising children in an antiquated school system, so what? We are just passing along the hypnotic trance to the next generation. I want to be clear – there are excellent and well-intentioned teachers, but they too are restricted, and pressured, in many of the same ways that distress our children. Traditional schools, in the U.S and many other countries, are training grounds, intentionally constructed to prepare children for The System. Public and many private schools are designed to program children to be asleep and stay asleep so that they will later follow along as adults. Our innocent kids are systematically programmed with worthiness issues, depression and the abhorrent need to fit in. Once a child is programmed for twelve or more years, he or she is well primed to move into the “real world” with beliefs and behaviors that feed and perpetuate a systematic agenda. Schools are structured, in such a way, that rewards are given for following along, being good, doing as you are told, memorization and repetition. Punishment is given for speaking out, thinking for yourself and not following along. Schools effectively teach students to feel powerless and to question their worth at every turn – breaking the precious spirits of our impressionable children. In many ways, schools use a military template in order to roll-out obedient citizens; long structured hours, endless homework, tests that create anxiety, and ceaseless memorization, with little time for recess. Keeping children sitting at desks all day also disconnects them from their bodies and the wisdom that is in the body. Many schools even look and feel like depressing military barracks. When I was a kid, I would sleep walk as a result of PTSD from school stress. Years later, I would still have nightmares that I failed a test. I would wake up sweating – needing to remind myself that school was over. There is even more school stress these days than when I was a kid. It is not uncommon for pre-teens to be on Prozac or other depression/anxiety medication because they are overwhelmed, anxious or depressed. An eleven year old should not even know stress!Kids should be free to create and express – to enjoy life and especially to delight in learning. No wonder the teenage suicide rate continues to increase. Medicating Our Young to Stay Asleep? Of course, there are children who don’t respond to school programming and do not go along with the agenda. These children are diagnosed with ADHD or ADD, but what we are calling a disability or a problem is actually natural creativity – energy that has no positive channel for expression in a school environment. Schools cannot handle “normally evolving children” – so these children are labeled and diagnosed in order to have an excuse to medicate – and sometimes separate. But that is only part of this problem, the real problem is that in order to appease teachers and school officials, many parents agree to medicate their children. Giving our kids dangerous drugs to stay asleep is like forcing them to take the blue pill in the Matrix! These children are asking us to evolve and we are responding to them with sedation. Our greatest power to consciously create lies in the “mental technology” known as Imagination.Everything begins with imagination. It is stronger and more powerful than any action that we take in the world. Isn’t it interesting that traditional schools shut down imagination? If you cut off a child from his imagination, you have cut him off from his power to consciously create his life. The System does not support imagination because it needs people to follow along and do what they are told in order to feed and sustain it. If everyone used their imagination and thought for themselves, most dysfunctional systems would break-down very quickly. To The System, a child’s imagination is the enemy, and therefore must be suppressed at any cost. Unknowingly, we, as parents, do the same to our children – only because it was done to us, and we have been brainwashed to believe that children must let go of their imaginative powers in order to succeed in life – or rather to succeed in The System. When we are awake, we can easily see that true success comes from the power of one’s imagination and the freedom to express it – ultimately manifesting in tangible results. Let me be clear – there are some schools that support and encourage the free and natural development of children, but the schools to which I am referring are established, and run, by government institutions that are invested in keeping future generations in line and asleep. Education is essential, but there is a huge difference between memorizing information that you will never use and being able to learn something because it will positively impact your life, or open your mind in some expansive manner, allowing you to create and contribute to humanity. There is so much to learn in this world, but traditional schools don’t address the most important elements of life, like communication skills, relationship skills, growing food, building homes, nutrition, natural healing, and the list goes on. If schools taught our children to be self-sufficient, confident and well-equipped for real life, The System would crash, or at the very least, dissolve naturally over time. What Can You Do if Your Child is in The System? I am certainly not saying that we should take our children out of schools or not put them there to begin with. I am saying that if we must send our kids to traditional schools that, at the very least, we tell them the truth in a way that is empowering and freeing and we not allow The System to raise our precious children for us. If your child is in the traditional school system, it is imperative that you be a strong parent and resist the pressure of teachers and school officials who try to tell you how to parent. Take your power back as a parent. Take a stand for your children. Stop caring what others say about you or your children. Don’t be bullied by school authority figures – who want you to bully your own children. Support your children in thinking for themselves. Overcome your own fears of breaking free. Find other parents who think like you. Form support groups for parents – and for the children. Be able to say no and set boundaries. Experience and process emotions in healthy ways. This might mean that you first embrace these things for yourself so that you can teach your kids, but that is also the point. When I took a stand for my children, each time the school initially fought back but ultimately backed off. I watched the school system (and a conventional ex-husband) bend in surprising ways to support each of my children. It is important to acknowledge the restrictions placed on your child’s teachers, but this doesn’t mean that you should take no for an answer. Your child’s teachers can be your best allies in creating a superior school experience. And, don’t be afraid to kindly and respectfully educate your child’s teachers to a more enlightened approach to teaching. We are all learning and waking up together. Most of all, trust yourself as a parent, and don’t be afraid to go against the grain, in support of your children. My three children have excelled in extraordinary ways – for example, when my son, Travis, broke free of the school system at sixteen, he took all that “military time” he would have spent in traditional school and he used it every day studying things that he was truly interested in. In under two years, he mastered a musical instrument, taught himself how to draw portraits, developed communication skills, become an expert in body building and he even started his own business at the age of seventeen. If he had followed along like society demanded, at this time, he would be scratching his head and moving into the next phase of an inauthentic life. Ultimately, we must own the education experience for our children and not leave it in the hands of a broken system that is asleep and that is invested in keeping our kids asleep. We must create a school experience that, first and foremost, supports the well-being of the child – mind, body and spirit. Then we must structure education in a way that empowers children to thrive and to use their minds in ways that support the growth, empowerment and sustainably of the world. Education should instill confidence, inner strength, wisdom, intuition and the ability to learn. Eventually our school systems will be built on this fundamental foundation, but until then, we as conscious parents must bridge the gap by raising conscious children and helping them to develop these essential attributes, in or out, of the current school system. This requires that we wake up and pay attention – that we are not afraid to speak the truth to our children, nor do we hesitate to empower them to think clearly for themselves. As parents of awakening children, we must be fully awake ourselves, and we must embrace the courage to raise and support extraordinary children. Children who think for themselves grow up to be adults who change the world! Nanice Ellis’ book “ZestPoint - the power of choice!” can help you learn how your power of choice can empower you to transform your life, overcome challenges, open your heart to love and joy, and be the change you want to see in the world. 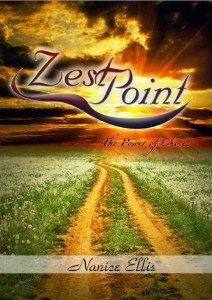 “Zest Point – The Power of Choice” is availalbe here in digital and paperback editions.